With iOS 10, Apple expanded Siri’s capabilities to third-party apps. Now you can enhance your own apps with voice commands to provide your users with bot-style interactions. We’ve just finished developing an iOS application for one of our clients that integrates with Siri. The app allows clients of a consulting company consult with their managers through a voice messaging system. Here’s how it works: a user opens Siri and says: “Send a <NAME OF APP> message telling my managers that I need help.” Then the request is sent to the managers. In this article, we’ll tell you how we integrated Siri in our app. We hope this article will serve as a useful tutorial to help you build your own apps with voice assistants. Before you start, you need to choose a domain based on the tasks that your app will perform. As described in the SiriKit Programming Guide, there are a few domains to choose from: VoIP calling, messaging, payments, photos, workouts, ride booking, CarPlay, and restaurant reservations. These domains cover a lot of use cases, but your are restricted to that list. We chose the messaging domain for our Siri integration. 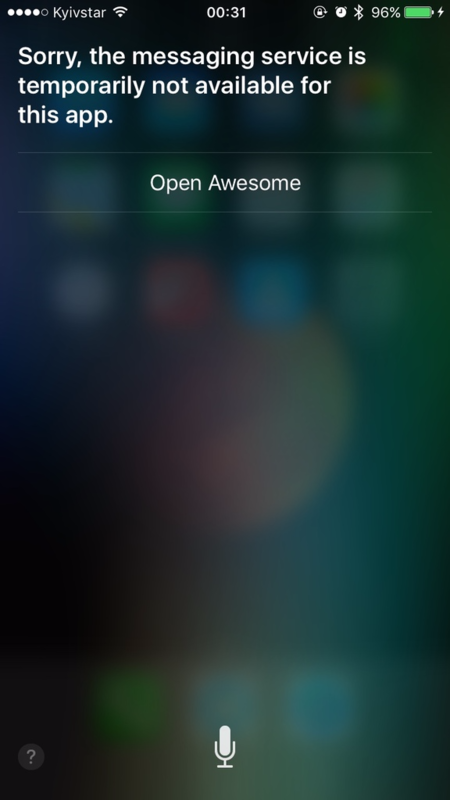 Siri uses intents to propagate user actions. 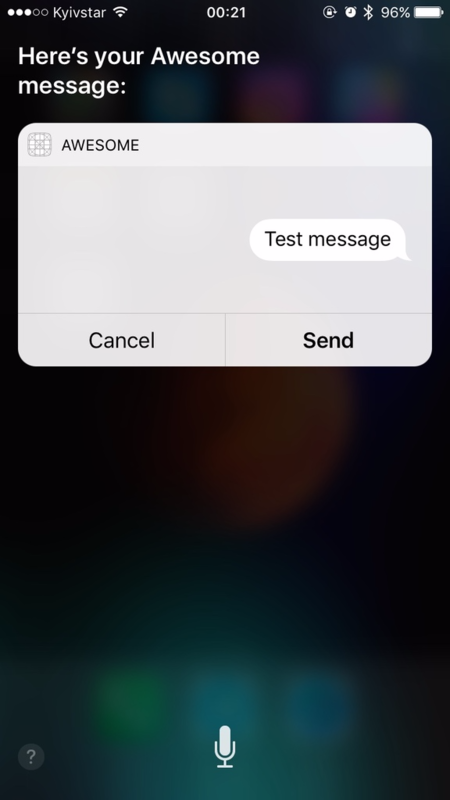 When a user requests an action from Siri, it sends the user’s intent, along with necessary additional information, to the handler for that intent. Siri’s messaging domain supports three kinds of intents: send a message, search for a message, and assign attributes to a message. Each of these intents has its own protocol that has to be implemented by any handlers for that intent. SiriKit also provides the ability to extend the default UI in the Siri window, but in our case the default UI fit just fine. 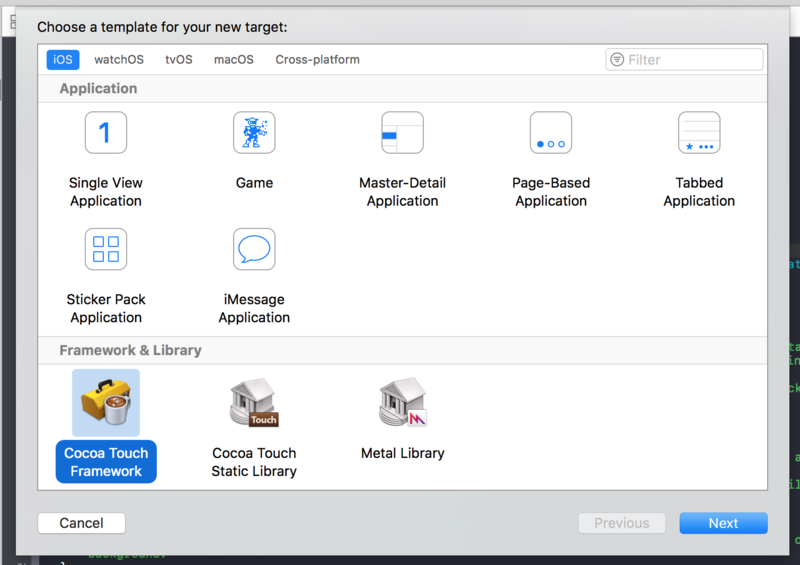 First, we needed to create a Cocoa Touch framework for our app. 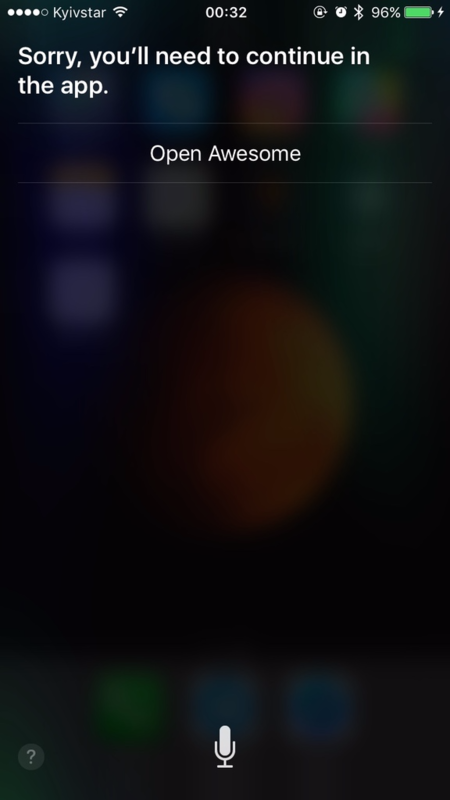 Because Siri support must be implemented via the Intents Extension, you can’t use code directly from your project. That’s why we used the Cocoa Touch framework. In the next window you can change template options and assign a name for your framework. Let’s call it ”Core.” Double check that your framework has the same Project and check “embed in application” field. Next, you’ll need to add classes to the framework. In our case, we added classes that define the domain of user requests and send those requests to our backend team. If you have your classes already implemented you need to move them to the “Core.” This can be implemented by removing your classes from your main target and manually adding them to the framework target. Then in your main target, you can import the “Core” framework and use your classes. In the above code, we specified the supported intents list (which contains only one intent in our case, “INSendMessageIntent”). If you need to restrict access to intents for locked devices, you can specify a restricted intents list using the “IntentsRestrictedWhileLocked” key. The “INSendMessageIntentHandling” protocol requires the use of “NSObjectProtocol,” so the handler inherits from “NSObject.” The “INSendMessageIntentHandling” protocol contains one required and four optional functions. You can find more information about it here. Right now, we are interested in only the four optional functions. The first function, the optional one, is “resolveRecipients(forSendMessage:with:).” In this function, you can indicate the recipient(s) for a given intent. In the above code, we take possible recipients from the intent and provide a resolution result for each of them. In the above code, we check whether an internet connection is available and whether a user is authorized in the application. “NSUserActivity” is passed to the application when the app is opened. If the validation fails, we return an error and an appropriate status code. For instance, if we pass “failureRequiringAppLaunch,” Siri will suggest that a user open an app. When the user opens the app, we could resolve the “userActivity” and suggest that the user try again after authorization. In this function, we resolve the domain of a user request and send a wrapped message to the server. “intent.content” contains a text message recorded by the user. If our attempt fails, we send a “.failure” response code so Siri can tell the user that their request wasn’t sent. You can find the complete implementation of “MessageIntentHandler” on GitHub. As described in Apple’s docs, you can implement your own custom dictionary of app-specific and user-specific words that Siri might misunderstand. It’s optional, but you’ll be reminded about this during the Apple review process. 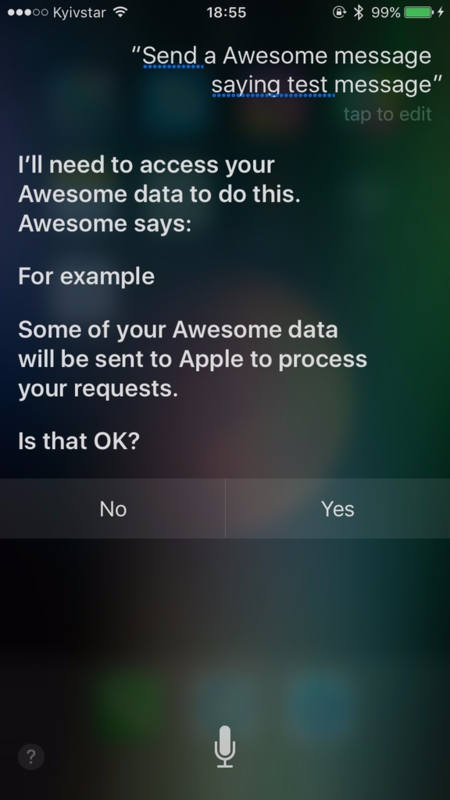 You can manually request Siri Usage permission by calling “INPreferences.requestSiriAuthorization,” but if you don’t, then Siri will ask for you to do so upon first use. Siri recognizes your app only by its name. For instance, if you provide English and Russian localisations for your app without specifying a localization of the name, then when a user sets Russian as their Siri language, Siri won’t recognize your app and users won’t be able to send requests. To solve this problem you can provide a “CFBundleDisplayName” key for any localization with the appropriate value.